News is surprise. 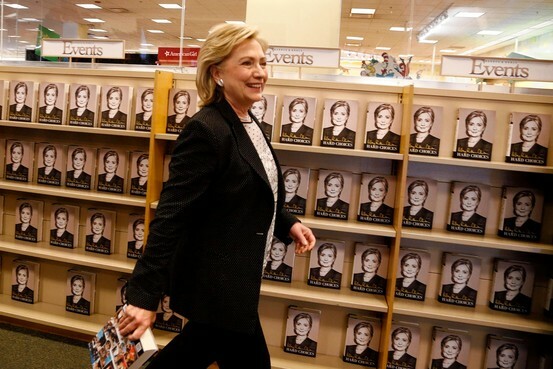 The news out of Hillary Clinton’s book tour is that it hasn’t gone well. It was supposed to establish her iconic position in American political life while solidifying her inevitability. Instead it exposed vulnerabilities. The media was neither at her feet nor at her throat but largely distanced, which was interesting. Her claim that the Clintons were “dead broke” when they left the White House inspired widespread derision. Her exchanges on Benghazi didn’t bury the issue but kept it alive. The scripted answers were tiring. The old trick of answering the question you wish you’d been asked instead of the one you were is weary to the point of antique. So is her tendency to filibuster. On Thursday she almost committed candor in an interview with PBS’s Gwen Ifill. Ms. Ifill was teasing her out on the presidency. Hillary, with a look of good humor, said that frankly, “you have to be a little bit crazy to run for president . . . so totally immersed, and so convinced that you can bring something to that office”—and then she caught herself, mid-honesty, and lapsed into a long, fatuous aria about how she sees the people and they tell her of their struggles. It was sad. She was almost interesting! Her tendency to check herself comes across more as a tic she can’t control than an attempt to maintain discretion. The book was almost uniformly panned. Sales were disappointing, falling a reported 44% in the second week, which means word-of-mouth wasn’t good. To top it off, The Wall Street Journal and NBC released a poll taken at the height of the tour that said while 55% of Americans find her knowledgeable and experienced enough to be president, less than half consider her honest and straightforward. But the tour yielded three positives. Mrs. Clinton put away the issue, if it was an issue, of age. She has sufficient energy, brightness and hustle to banter and party with interviewers and audiences in a lengthy major national tour. There is nothing wrong with her brain. In fact, she changed the way you see her when you think about her. Twenty-two years ago, when she first arrived on the national scene, she was the brittle harridan in the headband, the high-ticket attorney who wasn’t gonna be bakin’ no cookies. That image has changed over the years, but during the tour the change became definitive. Now she’s Mom—mature, settled, with a throaty laugh and a thickening middle. Or grandma. After six years of presidential leadership from a lithe, supple, snotty older brother, Mom will seem an improvement. Mrs. Clinton also re-established the fact of her experience, eight years a U.S. senator and four as secretary of state. She wanted to remind us, and did, that her professional résumé is superior to that of the incumbent and his predecessor. And she was interesting and believable when she said women in politics have it tougher than men, that they come under stranger scrutiny, are subjected to greater demands and more outrageous insults. This is true, and there isn’t a Republican congresswoman who wouldn’t give you an earful on it. As to the vulnerabilities made more obvious by the tour, the talk of Mrs. Clinton’s wealth, which followed her protestations of near-destitution when she left the White House, reminded people of the Bonnie-and-Clyde factor. The Clintons now hold a place of high respect and stature. But before they were Eleanor and Franklin they were viewed by their critics, and not only their critics, as Bonnie and Clyde. Most of their scandals were about money—from luckily timed cattle-future investments to Whitewater to campaign-financing lapses to last-minute pardons for donors to “renting out” the Lincoln bedroom, and more. Mrs. Clinton seems to have a peculiar and unattractive relationship with money. She wants it and she doesn’t want you to know. She also appears to think she’s entitled to it, as a public servant who operated at high levels. But public servants now are less like servants than bosses. When an interviewer compared her to Mitt Romney in terms of wealth, she got a stony look. That is a “false equivalency,” she said. You could see she feels she should not be compared to a wealthy Republican because she’s liberal and therefore stands for the little guy. So she can be rich and should not be criticized, while rich people who have the wrong policies—that would be Republicans—are “the rich” and can be scorned and shamed. This is seen by some as hypocrisy but is more like smugness. It is Mrs. Clinton’s habit to fake identification with people who’ve had real struggles by claiming she’s had them too. All humans have struggles, but hers were not material. She came from a solidly suburban upper-middle-class home, glided into elite schools, became a lawyer, married a politician who quickly rose, enjoyed all the many perks of a governor’s mansion and then the White House, and then all the perks of a senator, secretary of state and former first lady. She’s been driven in limousines and official cars almost all her adult life. For more than a quarter-century she has seen America through tinted windows. Newly out of the Ivy League, she asked for political power instead of financial power. Many of her generation of liberal activists, with similar bona fides, chose the latter. She married and became a politician and accrued great power and fame. But she still wanted the money. Through speeches, appearances, books and investments, she got it. Bill seems happy with it. She sees a disjunction between her acquisitive streak and her party’s demonization of acquisitive streaks, and so she claims she was broke, at the mercy of forces, an orphan in the storm, instead of an operator of considerable hunger and skill. All this has made her look silly and phony. One wonders what she thinks of the base of her party that she can’t knock it off. As for the book, it is actually the first I have encountered that was written so a politician could say, “I wrote about this at length in my book.” It exists to offer a template for various narratives and allow her to suggest she’s already well covered the issue at hand, which the interviewer would know if he were better informed. Ladies and gentleman, that is the authentic sound of 2016. Shoot me now. Why do Democratic politicians talk like this about themselves, putting themselves and their drama at the ego-filled center, instead of policy ideas, larger meanings, the actual state of the country? In this she is just like Barack Obama.